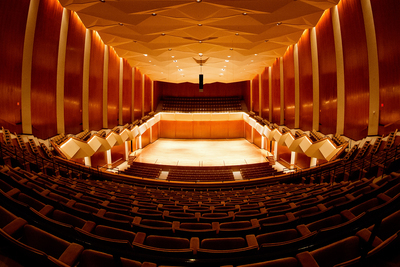 The University of Illinois Symphony Orchestra will perform in Foellinger Great Hall at Krannert Center for the Performing Arts on Jan. 27. 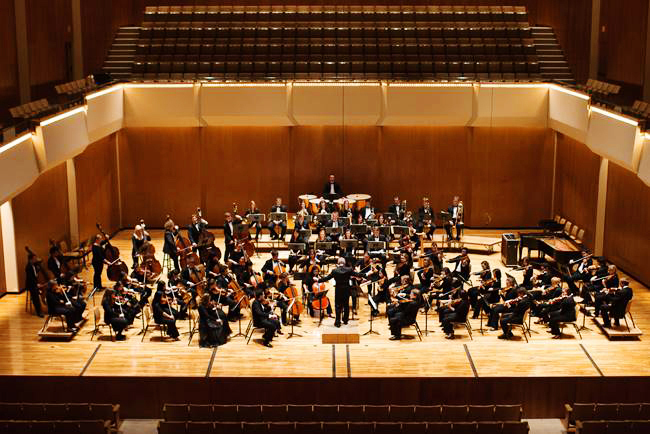 CHAMPAIGN, Ill. — Fans of the music of Mozart will hear some of his best-known works as well as less familiar pieces at a Mozart birthday celebration by the University of Illinois Symphony Orchestra. 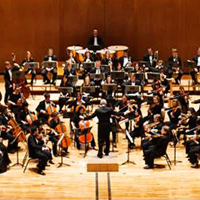 The orchestra’s conductor, Donald Schleicher, scheduled the concert for Jan. 27, Mozart’s birthday, at Krannert Center for the Performing Arts. Mozart birthday bashes featuring the composer’s music are common around the world, he said. Schleicher wanted to include not just the standards but also some more unusual pieces to show the wide range of Mozart’s work. He also wanted to include as many faculty members from the U. of I. School of Music as possible. “It’s a unique chance to hear so many School of Music faculty members on the same evening,” he said. The University of Illinois Symphony Orchestra will perform some of Mozart’s best-loved works and less well-known compositions in celebration of the composer’s Jan. 27 birthday. An unusual component of the concert will feature a small wind ensemble directed by director of bands Stephen Peterson playing excerpts from “Don Giovanni” written for a wind octet. An arrangement of opera music for a wind ensemble was used to promote an opera at the time Mozart was composing. The performance will provide a preview for the Lyric Theatre @ Illinois performance of “Don Giovanni” in late February, with Gunn both singing and making his directorial debut. Julie Gunn, the director of Lyric Theatre Studies, will provide commentary about “Don Giovanni” during the wind ensemble performance. The second half of the concert will feature three pianists from the music faculty – Rochelle Sennet, William Heiles and Timothy Ehlen – performing Concerto No. 7 for Three Pianos in F Major, K.242. The composition is rarely performed because of the difficulty of positioning three grand pianos together in a performance space, Schleicher said. The concert gives the three pianists the uncommon opportunity to perform together as a trio. “Mozart is so famous as a writer of piano concertos. He wrote so many, and this one is the least-performed,” Schleicher said. Editor’s notes: Tickets for the U. of I. Symphony Orchestra’s Mozart’s Birthday Celebration are available at the Krannert Center box office, 500 S. Goodwin Ave., Urbana, by calling 217-333-6280 or online at krannertcenter.com. To reach Donald Schleicher, email schlchr@illinois.edu.